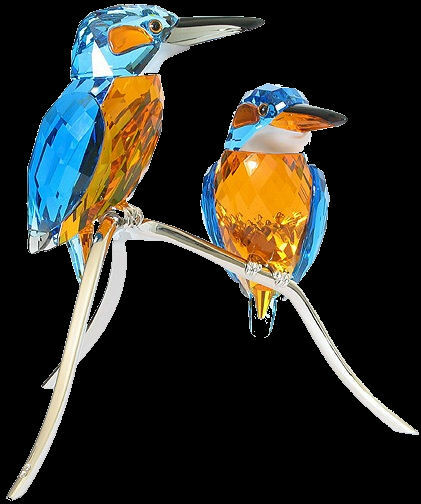 Two exotic birds–Pair of Kingfishers and Bee-eaters–from the Daniel Swarovski Paradise Collection. Simply awesome! The pair of Kingfishers in Blue Turquoise, Aquamarine, Sun and clear crystal is designed by Anton Hirzinger and has approximately 20 parts. 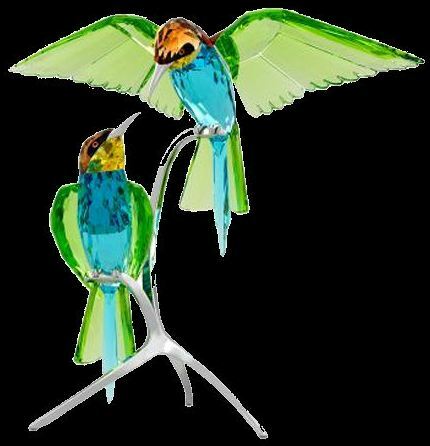 The pair of Bee-eaters in Peridot crystal with heads in smoked Topaz crystal with accents in Jonquil and Indicolite crystal is designed by Heinz Tabertshofer and has approximately 30 separate parts. The birds in the Crystal Paradise theme were inspired by the true story of the lakeside flora and fauna of the Silver Lake wildlife preserve in Bulgaria. The area has been under UNESCO protection since 1977 and is very abundant in plants in addition to being the breeding ground and winter refuge for numerous species of birds, many of which are rare or endangered. Lovely.. You own these? WOW I envy you..
Suja: Thanks. Yes these are two among the beautiful items by Swarovski. I don’t own them, but I have seen them when a friend bought them and showed it me on his way home. Ennalum oru kaaryam parayathe vayya..
kazhinja post-il kaanicha plant njan adichu mattum !